I’ve written about several of my beer drinking experiences from my trip to Cape Town, but it is time to move on. I’ve enjoyed reliving the trip through my blog posts, but this will be the final post about my African adventure. Call this the final run down of my trip to Cape Town. Highlight of the Day: Flight from Washington, D.C. (Dulles) to London Heathrow Airport. Beer of the Day: Dominion Ale, an English-style ale from Old Dominion Brewing Company (Dover, DE), in the terminal before the flight. Highlights of the Day: Killing a ten-hour layover by taking the express train from Heathrow into London; lunch with Kathleen and her friend at Inn the Park in St. James Park; walking around London and seeing Buckingham Palace, Parliament, Westminster Abbey, Big Ben; getting back to the airport in time for the flight to Cape Town. Beers of the Day: Fuller’s London Pride with lunch; Greene King IPA on draft at The Old Monk Pub; John Smith’s Bitter on draft at St. James Tavern. 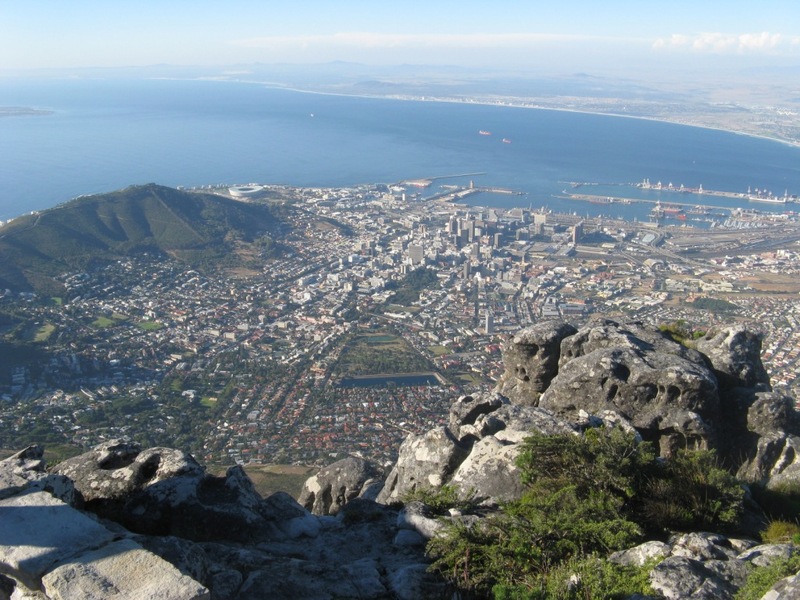 Highlights of the Day: Touch down in Cape Town after two overnight flights; hiking to the top of Table Mountain and enjoying the views of the Cape, then taking the tram down; dinner at The Dubliner overlooking vibrant Long Street. Beer of the Day: Bottle of Mitchell’s Forester’s Draught Original on top of Table Mountain; Windhoek Lager with dinner. Highlights of the Day: Exploring the V&A Waterfront; lunch at Mitchell’s Waterfront Brewery and Scottish Ale House; Opening Reception of ICA 2010 on the front lawn of the Premier of the Western Cape province. Beers of the Day: Mitchell’s 90 Schilling at lunch; Castle Lager at the Reception. Highlight of the Day: Opening day of ICA 2010. Beer of the Day: Windhoek Lager with dinner at Krugmann’s Grill at the V&A Waterfront. Highlights of the Day: Lunch at Paulaner Bräuhaus Cape Town; Gala Dinner at the Castle of Good Hope. Beers of the Day: Paulaner Red Weiss at lunch; Castle Lager at the Castle. Highlights of the Day: Sampling African beers in my hotel room; ICA 2014 dinner party, listening to live music late night at the Paulaner Bräuhaus. Beer of the Day: Red Weiss at Paulaner Bräuhaus. Highlights of the Day: Tour and wine tasting at Neethlingshof Estate; walking around Stellenbosch; dinner at the V&A Waterfront overlooking the harbor; sampling Belgian beers at Den Enker. Highlight of the Day: Closing Ceremony of ICA 2010; packing to go home; flight to Frankfurt, Germany. Beer of the Day: Castle Lager at the Soaring Hawk Spur at Cape Town International Airport before the flight out; Warsteiner Premium Verum (Warsteiner Brauerei, Westphalia, Germany) on the flight from Cape Town to Frankfurt. Highlight of the Day: Breakfast in Frankfurt; landing at Dulles Airport and driving home! Beer of the Day: Tall can of Bitburger Premium Pilsner (Bitburger Brauerei, Palatinate, Germany), bought at the airport and drank on the flight home. I’ve uploaded some of my photos from my trip to the BoaBeerBlog photo stream on Flickr.